On October 20 2018 I (Shreeram Thapaliya) did Mardi Himal trek with my 4 fantastic and helpful guys. 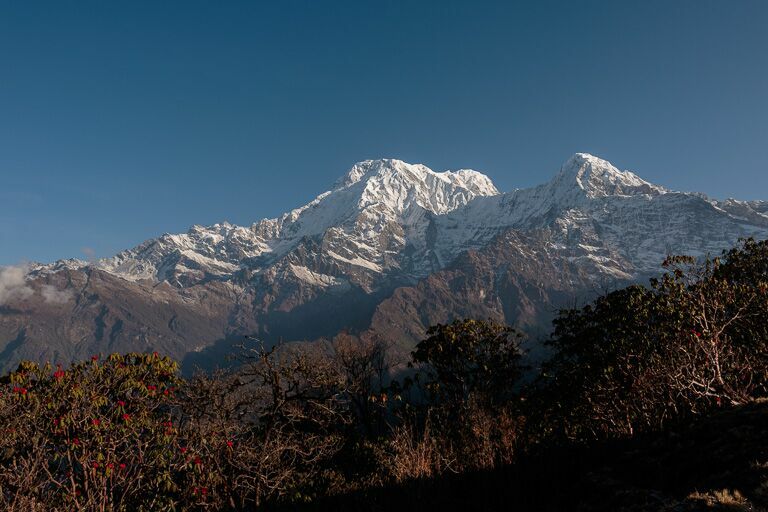 We led the 7 Italian people to 7 days most fantastic and magnificent trek of Annapurna region. First of all that was the festival time in Nepal. We were in pokhra during the last day of dashain and we should had to start our trek the next day. We were quite worried about the vehicle, because the next day we had to start early in the morning. I was trying to manage the vehicle. Finally I could manage but was double expensive than normal time. I said ok, let’s go with this. 20 October we waited 1 hour more than we scheduled because of festival time was still going. We rode on the jeep at 8.30 am and we were at our trekking starting point around 10.00 am . Perfect time we did just three hour easy trek until Deurali via beautiful village pothana. We had some good view of mountain too. I had already booked the big hotel in Deurali so we actually got 4 Rooms for that night. We stayed there and had a wonderful moments. My boys was playing the Italian cards to spent the time. We had a great dinner and good sleep too. 21 October 2018: we woke up early in the morning around 7 and had a breakfast. We became ready at 7.30 then began our trek through very beautiful lush, rhododendron, oak trees forest. The trail was pretty good . the worker was doing there work to maintain and upgrade the trail conditions. I was pretty impressed with this so I tipped them 100Rs which was small amount but was great from Nepalese. Some followers behind of us as well as some forwarders who were co trekkers with us. I was so much worried about the hotel often I was trying to call the Hotel in Forest camp but getting a lot of disturbances because of poor network. Finally I was able to call and booked the hotel in Forest camp which was forest camp guest house. We were there at 11.45 am. It was quite early but it is normal plan to stay in forest camp. We stayed there had lunch and dinner there but the thing was there were so many Nepalese local visitors than we expected 100 of them were passing to get the hotel which was already occupied. Some of them they slept in castle while others were just spent there night with campfire for whole night. I got some space in the dining room where I slept it was just for one people but that time we were two in small one bed. I was not able to move my body and change my position of sleeping. I hold pee for 2-3 hours because everybody was just lying on floor. 22 October 2018:We repeated our usual task on similar time by wake up and heaving breakfast . After that we climbed through the forest. It was not so much accent. The trail was sloppy quite but all the way through forest till low-camp. Our some people were quite faster so they were waiting us heaving tea. We met them and started our trek again. It took us 5 hours to be on the badal danda. We did lunch there and spent time there by chatting as well as playing badminton..
23 October 2018: As always we started our trek with beautiful scenery of a Annapurna Himalayan range. Particularly Annapurna South and Hinchuli. 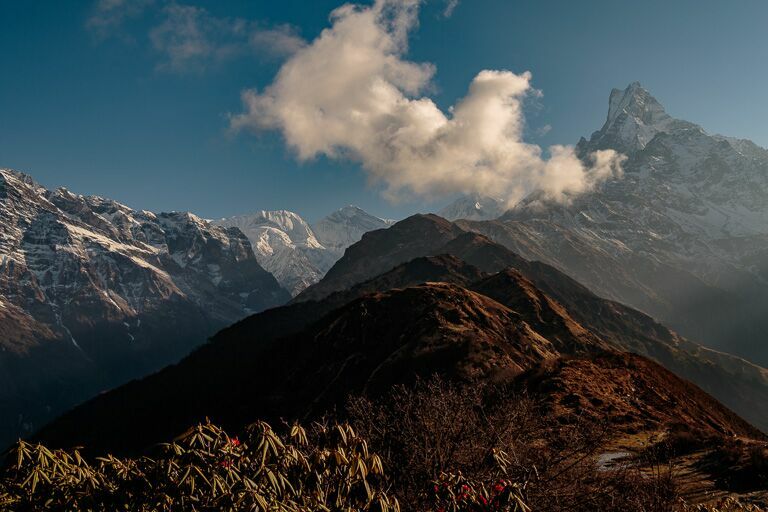 Those are magnificent as we move towards north we had a spectacular view of Annapurna II, Gangapurna as well as our Best and Magnificent Mountain Fishtail. It took two hours to Reach to Highcamp. As that was the main season there was a lot of Nepali trekkers too. But we manage a room some how as well. 24 October 2018: Today we manage to wake up early because we had to go to see the view from View point as well as Mardi Base camp. There were many people with us. The morning was pretty cold as we started around 4:30. It took us 2.30 Hours to be in the view point around 4200M. From there we had a splendid view. There was a big group of para gliders preparing for a fly to Pokhara. We enjoyed a bit seeing them. We dawned some videos. Then we back to High Camp. Sono stati 5 giorni molto belli e intensi. Paesaggi splendidi e cammini piacevoli. La nostra guida ha organizzato tutto perfettamente anche perchè c’erano moltissime persone del posto che come noi facevano trekking per vedere uno scenario spettacolare che mi rimarrà per sempre nel cuore. Ringrazio Shreeram e i suoi collaboratori per tutto quello che hanno fatto! La cosa importante e che abbiamo iniziato il viaggio con 5 accompagnatori e siamo tornati con 5 Amici!